Biceps muscles provide an ideal spot for tattoo placement not only because they naturally accentuate a man’s masculinity but also because they make it easier to hide the image drawn. A bicep tattoo, regardless of the design, will always appear seamlessly attractive when inked properly on the skin. In fact, biceps is one of the areas of the body that hurt less when a tattoo is being drawn. So if you’ve been wondering where to place your favorite tattoo design, here is the most viable option to consider. Majority of bicep tattoos for men are worn to improve the attractiveness of the muscles and to show how trendy one is. 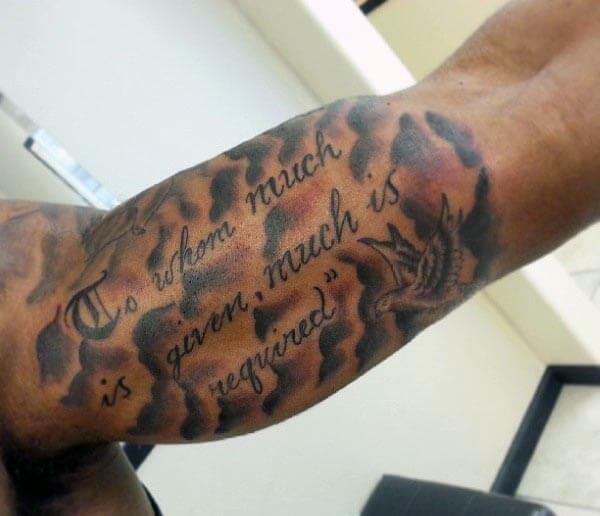 However, the meaning of each bicep tattoo largely depends on the particular design one chooses to put on. For instance, a wolf tattoo on the biceps may be used to signify fearlessness, strong connection to instincts or high intelligence. Tribal biceps tattoos may symbolize audacity, dynamics and expressiveness. On the other hand 3D portrait tattoos can be used to mean the passion for realism, inner strength or to give an impression of being machine-like. Tattoo wearers can also choose to have specific images or text on their biceps either to mourn their loved ones, to express love or pass on a certain meaning. No matter how unique you want your tattoo design to appear, an experienced tattoo artist can always work towards making your dream come true. What are the Most Popular Biceps Tattoo Designs Available? 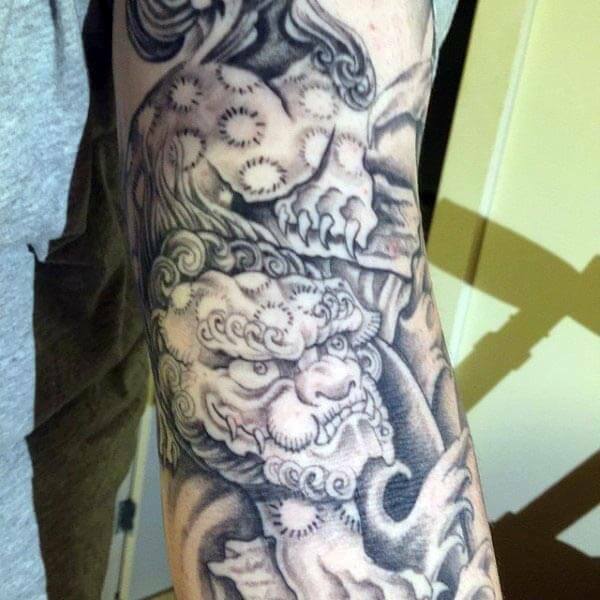 Currently, there are plenty of popular bicep tattoo designs that you can explore. From tribal tattoos to wolf and animal tattoos, spiritual tattoos all through to game-inspired tattoos, there are plenty of designs you can explore. Majority of these popular tattoos designs are worn by celebrity rappers, movie actors and wrestlers. The tattoos are can either feature pure image drawings or images embedded with relevant text. There are absolutely no limits to what you can do to achieve the tattoo design you desire. It is all about how far you can go with your imagination. Are Biceps Tattoos Expensive To Draw? 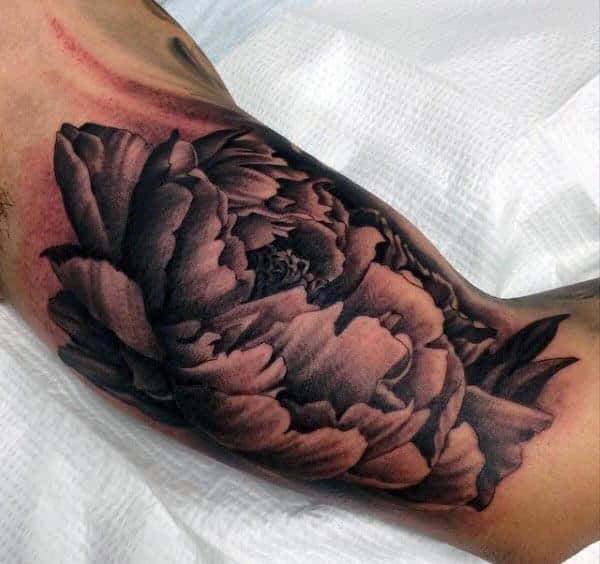 The cost of bicep tattoos for guys will usually vary depending on the size of the image, the amount of detail and the colors used in completing the artwork. For instance, a 3D image covering the entire biceps canvas can cost more than a sizable 2D image on the arm. That’s because there’s more ink and time spent on the former compared to the latter. Also, a tattoo that involves use of many ink colors will likely cost more than a tattoo completed with black ink only. However, you can always compare among the various tattoo artists to find one that offers biceps tattooing at convenient pricing. 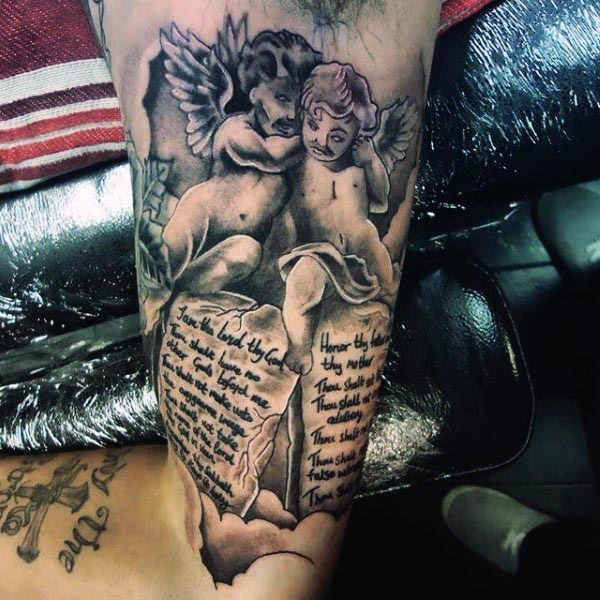 This bicep tattoo of two angels and the ten commandment tablet is inspired by the Biblical story of Moses and the Israelites. The tattoo depicts an ancient method of communication between God and man. This tattoo is related to Christianity and Judaism. 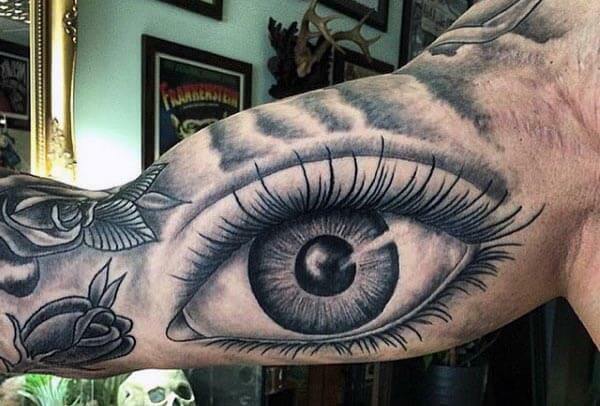 This tattoo is an image of a 3d open eye on rose flowers. The tattoo artist has paid attention to detail. The eyelashes, the eyelid, the pupil make it look real. The blossoming flowers surrounding the eye give it a calming effect. This smoky eye tattoo takes a rock star angle. The symbol of the skeleton is related to cultic practices and underworld religions. This bicep tattoo design is perfect for a metal music fan. It is masculine, and it’s among the favorite bicep tattoos for guys. This is a flower tattoo. Flowers are not just for the girls. The thickness of the flower bush gives it a masculine touch. This is ideal for cool personalities who love mother nature. This will be a great look on the biceps. 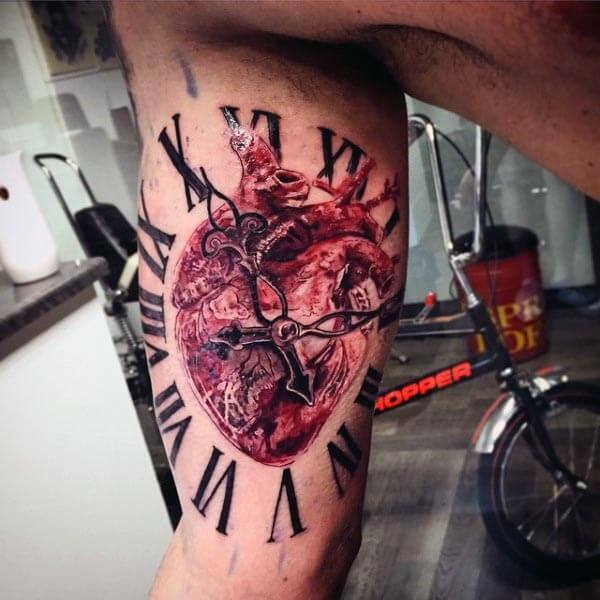 The heart-clock tattoo is among the most creative bicep tattoo ideas in the tattoo industry. The image of the heart is finished with the color red to make it look like a real heart. The arm clock adds an interesting twist to the image. This is a half-human, half-monster tattoo. Bicep tattoos for men mainly reflect a strong personality. This tattoo idea is suitable for the tough and adventurous person. The angry face of the monster and the big feet are symbols of superiority. 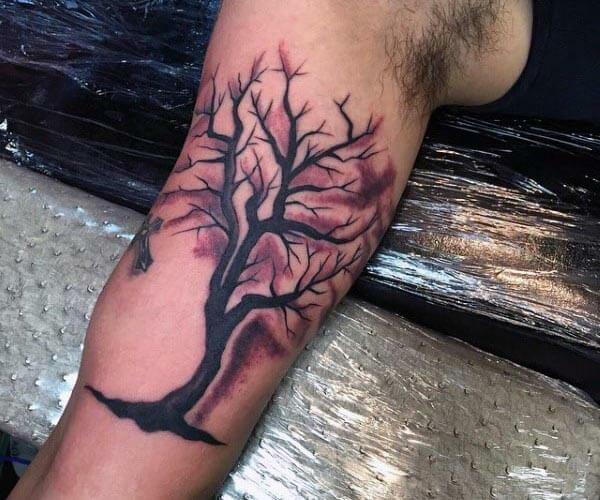 This tattoo shows a leafless tree under a red sky. The absence of leaves could be interpreted as a sign of drought and the red sky as a sign of danger. The symbol of the cross is used in many religions to symbolize supernatural power. 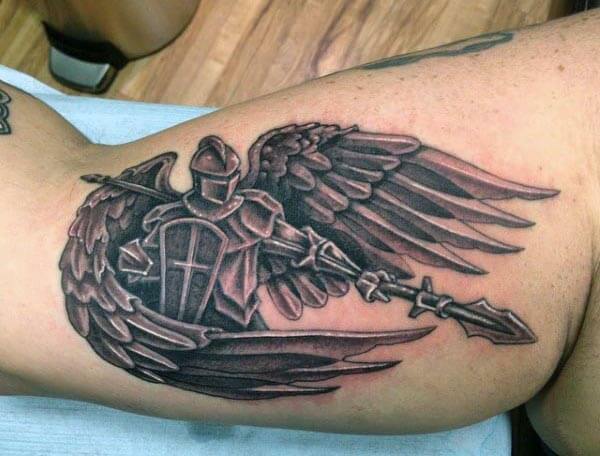 This tattoo of a knight in armor is a symbol of power and respect. The knight has wings and is armed with a spear and a shield. This makes the list of the best tattoo ideas for men. This is a quote tattoo. The quote �To who much is given, much is required’ means that the more the resources one has, the more the responsibilities. The dove symbolizes peace and the clouds give the tattoo an inspirational feeling. This is the stained glass window tattoo. 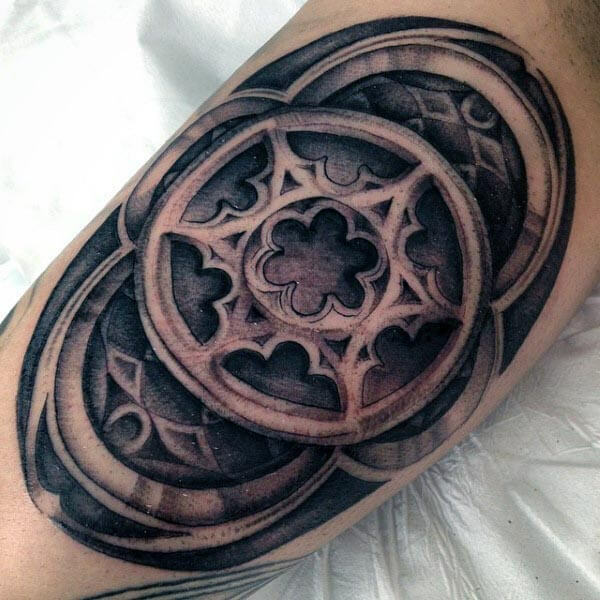 This is an old tattoo that is inspired by the stained windows in old churches. 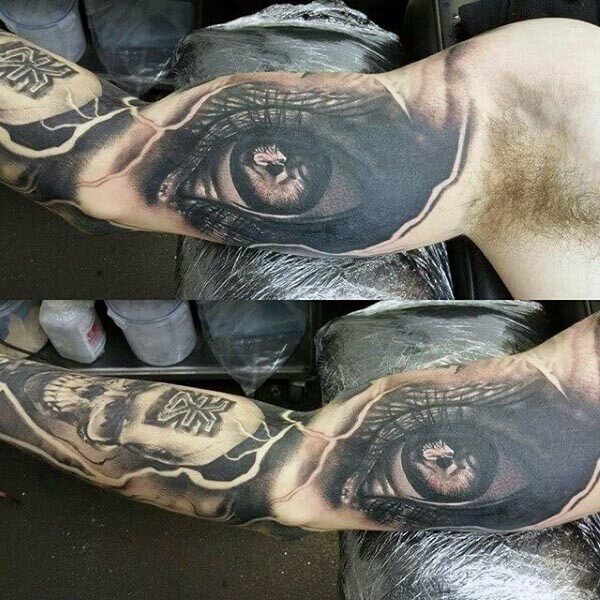 It is one of the most unique bicep tattoos. This tattoo is bold and mysterious. It is used as a religious symbol by most men.